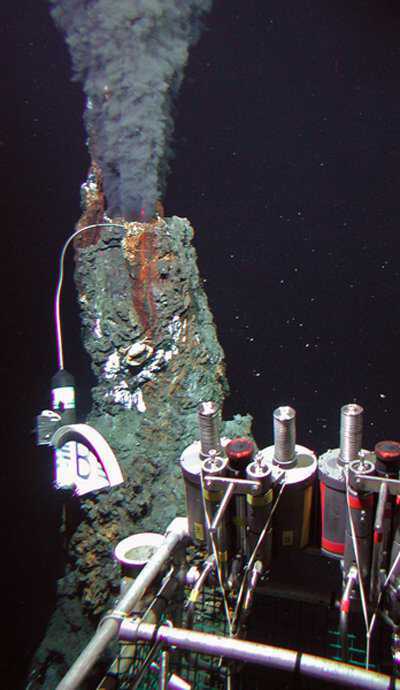 A deep sea geologist explores submarine volcanoes at depths of 12,000 feet. Staring up into the night sky as a kid and wondering what was out there started my journey to a career that involves diving in a cramped submersible vessel into the darkness of the deep sea to see what’s there. By the time I was 15 years old, I discovered I was already too big to fit in those small early space capsules as an astronaut. 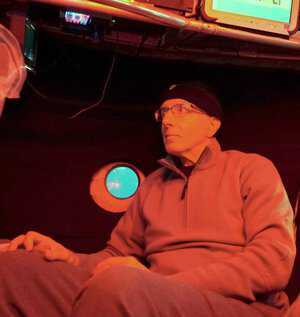 My focus shifted toward inner space, thanks to Jacques Cousteau’s documentaries, detailed maps of the seafloor and historic dives to the deepest parts of the ocean in submersibles. In college, I was introduced to the wonders of geology and how the spreading seafloor was one of the keys to understanding the newly developing theory of plate tectonics. I was hooked. After obtaining my Ph.D., my grad school colleague Dan Fornari connected me with scientists from the National Oceanic and Atmospheric Administration who were using the HOV (Human Occupied Vehicle) Alvin to study the geology of the Galapagos Rift – a spreading ridge where deep sea hydrothermal vents and animal communities were first discovered in the late 1970s. They needed a “hard-rock” geologist with a marine geology background to collaborate with them – and I was thrilled to join their expedition leaving from Acapulco. A plate tectonic event nearly stopped me from joining the cruise when the 1985 Mexico City earthquake delayed my flight for hours. My first Alvin dive into the active volcanic rift was nearly beyond description: frightening, exhilarating, fascinating, tiring and the most exciting event in my life to that point. Although pre-cruise training by the Alvin pilots is very thorough, the fear of the unknown lingered until the hatch was shut and we were lowered into the water. What will I see? How dangerous is this really? Will the sealed sphere really protect me from the crushing pressure at depth? What is it like to be in such a small space with two other people for eight hours? Will I remember all that I am supposed to do? Do I dare drink the coffee provided? To my amazement, we were heading back to the surface before I knew it – my adrenaline level still high. My typical dive preparation actually starts in the planning stages of a cruise soon after an expedition is funded and a specific oceanographic ship is scheduled. 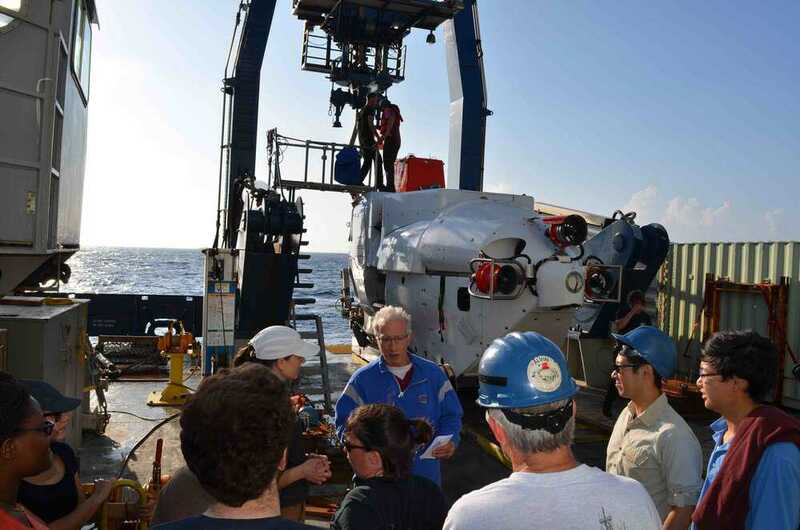 The research vessel Atlantis is specially outfitted to host Alvin and operate multiple deep submergence vehicles during a single dive. Most cruises last about a month, with around 20 to 25 dives planned in advance. A few days before each dive, researchers study maps of the dive area, discussing sites for specific sampling and measurements. The night before the dive, scientists each prepare a bag (generally a pillow case) full of the clothing and recording materials they’ll need. This typically includes a warm hat, pants, sweater and extra socks to put on while on the bottom because the sub rapidly gets cold and damp in the near-freezing seawater at depth. I try to get a good night’s rest because a typical eight-hour dive can be mentally and physically exhausting. I generally don’t eat or drink much on the morning of a dive and spend some time stretching before I have to squeeze myself into the “ball,” as the interior of the sphere is called. 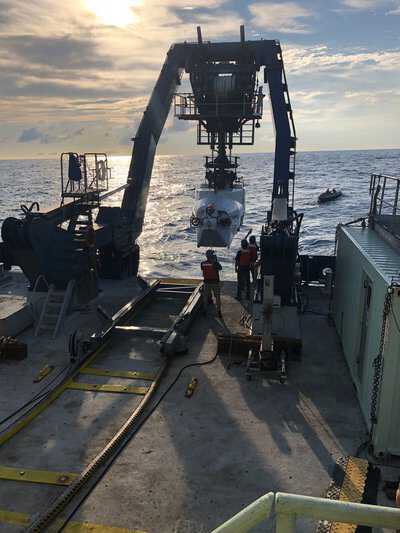 By 8 a.m., Alvin has been checked out, wheeled into off-loading position and is ready for the three aquanauts to slip down into the hatch and settle into position. 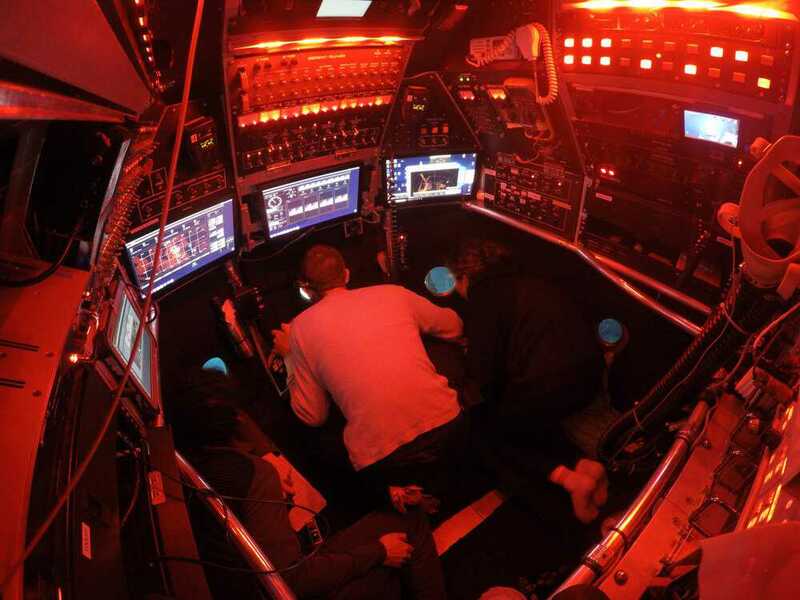 The pilot sits upright in the middle of the ball, while my colleague and I are tucked on either side under racks of electronics in a semi-prone position. There’s not enough room to fully extend my legs in this position. 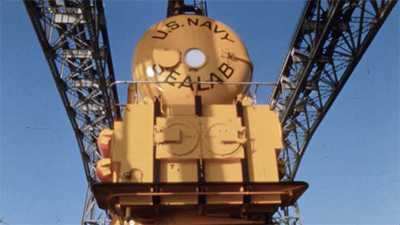 The heavy hatch above us is closed and sealed air and water tight to maintain atmospheric pressure throughout the dive – no turning back now. The pilot flicks on carbon dioxide scrubbers that recycle the air we breathe for the entire dive and adjusts the regulator that slowly leaks extra oxygen into the sphere. At just under 6 feet tall, I can just stand upright behind where the pilot sits, but there is only room for one. Other than to stretch my legs, most of the time I am on my knees looking out of the forward or side portholes or scribbling notes on sample sheets. Alvin lurches back and forth as it’s lifted off the deck and swung out over the ocean to be launched. Then there’s the comforting sound and feel of our entry into the ocean as seawater starts to cover the five small circular windows. 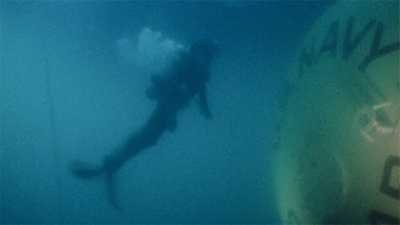 I can see the skin divers swimming around the sub, checking to make sure our equipment is still in place while they undo the recovery line to the ship. After running through a number of equipment and safety tests, we get the OK to begin our slow descent – descending at about 110 feet a minute, it will take over an hour to reach 8,000 feet. Bright light from the surface reflects off millions of small bubbles streaming around Alvin as we release some air to help us sink. Fairly quickly the sounds of the ship fade and the rocking from surface waves stops. Compared to all the motion and noise on the Atlantis, the interior of Alvin is pleasantly quiet and calm except for the hum of the air scrubbers and some music, picked by the pilot, playing in the background. As we steadily drift to the bottom, the light outside quickly starts to fade, becoming greenish at first, then slowly very dark blue. Tiny red reading lights illuminate the interior of the sphere. We keep Alvin’s external lights off to save the battery power needed for propelling us on the bottom. After 10 minutes, deeper than 600 feet, it’s almost lightless and hundreds of glowing bioluminescent organisms stream past the portholes. This magical light show reminds me of the night sky I gazed at in my youth. A half hour goes by and around 3,300 feet we are in the “midnight zone” where no light penetrates and the shimmering blue-green phosphorescence seems even brighter and more dramatic. By this time, I’m feeling comfortable but anxious to get to work on the seafloor, trying to anticipate what we might see. Approaching the seafloor, Alvin’s external lights turn on and we scout to let the pilot know when we see the bottom. For me, this is one of the most exciting and awe-inspiring parts of a dive because one never knows what will be there. Very slowly the lava- and sediment-covered floor of the ocean begins to appear as if out of a fog into the headlights. On most of my dives, we land away from the volcanically and hydrothermally active rift zone for safety reasons. These areas typically are covered with different types of lava flows – pillows, lobates and sheet flows dusted by sediment. Nearer the rift axis, areas where lava lakes filled, overflowed, and then drained and collapsed are common. Some areas have hundred-foot-high mounds of pillow lavas that have oozed out of vents or sheer walls hundreds of feet tall that have been thrust upward by tectonic forces. In some of the most volcanically active areas, I’ve found white, cotton-like organic mats covering the black lava flows that are formed by microbes living in the warm subsurface. Sometimes pieces of them are blown upward by streams of hot water flowing out of cracks and pits in the lavas. I’ve seen hydrothermal vents emitting black, sulfur-rich smoke, typically surrounded by communities of tubeworms, crabs, clams, mussels, shrimp and unusual fish – creatures that can survive this extreme environment thousands of feet below the surface. For six hours on the bottom, I direct the pilot where to go and what to sample or measure using Alvin’s two remarkably agile yet strong hydraulic arms. Multiple digital still and video cameras mounted on Alvin’s external frame record our journey along the seafloor while mini voice recorders and handwritten notes document our observations. Time goes by quickly and rarely do we get everything we planned done before the pilot notes our batteries are running low and drops hundreds of pounds of iron weights to start us on our hourlong transit to the surface. Even with our extra clothes on, it gets quite cold by the end of a dive so the extra blankets come out and I typically settle in with one of our packed peanut butter and jelly sandwiches. The glow of light announces our approach to the surface and I always hope the seas have remained calm or else we will experience some uncomfortable bobbing around while waiting for Alvin to be recovered. Once on board Atlantis and the hatch is opened, it’s a relief to fill my lungs with warm, fresh air and be able to stretch my legs again. Watching the recovery, congratulating the divers, particularly new divers, and checking out the samples we recovered is an evening event for the scientists. It’s been more than 45 years I’ve been researching the geologic features of the seafloor and I’m still excited about taking dives in Alvin. We’re still sampling, photographing, filming and observing, trying to answer questions about how over 60 percent of Earth’s crust is formed. How do submarine volcanoes erupt and what are they made of? Where and why do deep sea geysers – also known as hydrothermal vents – spewing 750 degree fluids form? And how does life thrive in these inhospitable environments? 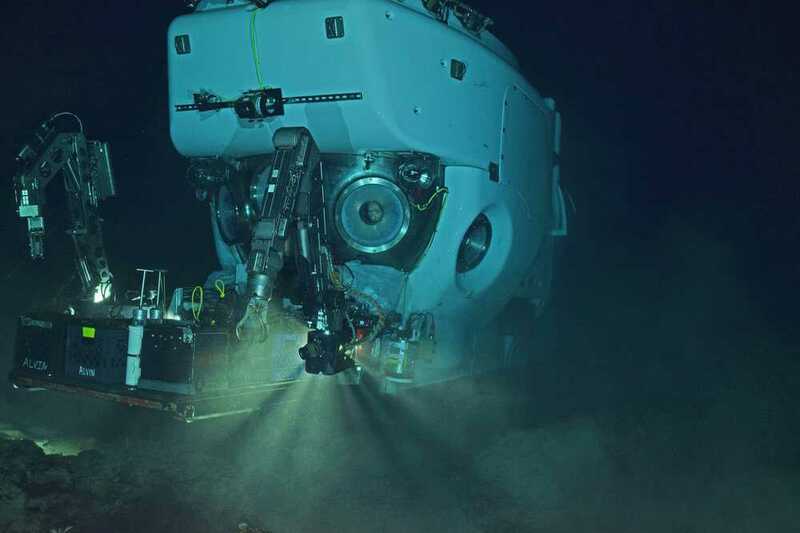 Even though there are many unmanned robotic subs that can dive to deeper depths for longer periods of time, what scientists see on shipboard video screens from remotely operated vehicles cannot compare to actually being on the bottom and seeing it in three dimensions. Michael Perfit is Professor of Geological Sciences at the University of Florida where he has worked since 1982. He has authored or co-authored more than 100 peer-reviewed technical papers and articles in professional scientific publications and has been a principal investigator on numerous research grants from the National Science Foundation and NOAA. His research has focused on the petrogenesis of mid-ocean ridge basalts, island arc lavas, magma genesis, and oceanic spreading centers. 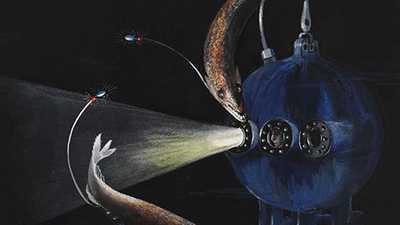 He has taken more than 35 dives to depths up to 12,000 feet in the deep-sea submersible ALVIN during his research. 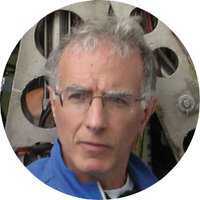 He has participated on over 20 oceanographic research cruises and served as co-chief scientist on several more. Watch the opening scene of Sealab.